Let’s introduce you to a city that is not far away from München in Germany. A city that is quite interesting with some very nice and the longest trams that I’ve ever seen! About one hour away from München with train, Augsburg hosts a huge tram network which transports lot’s of citizens in a city with around 275,000. This city is as big as Norway’s second biggest city Bergen, but hosts 6 tram lines which are very frequent! So, Bergen got many lines to add to even be able to compete! 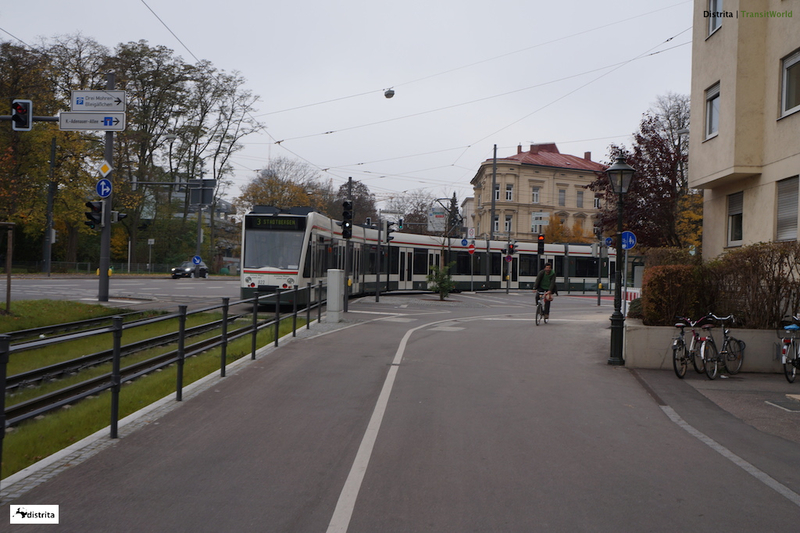 Another nice thing with Augsburg is that their trams are very long. When we visited this interesting tram system, we saw 2 types of low-floor trams. One of the type got quite nice design. These tram wagons were quite long, but the other ones was really long. Amazing! We have never seen so long trams. But, I know that Budapest in Hungary got world’s longest trams running. 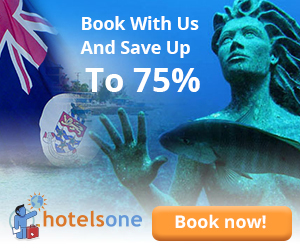 So, this is a city that we will certainly visit soon! All of the lines in Augsburg meets at Königsplats station in the middle of the city (as seen on the picture). The design when it is dark is spectacular. There is a white stripe light, which covers the roof edges of the building that hosts transit information center. In Oslo, where we have our office. The tram uses the same track gauge as metro or even train. On some sections like between Jar and Bekkestua, tram and metro shares the same track. However, if you want to build a tram system in a city with smaller streets, then 1000 mm gauge standard is better as the trams can cut corners much more effectively. So, Oslo should have this for sure! But to change all of it’s tracks would cost a lot. So it’s really not worth it. 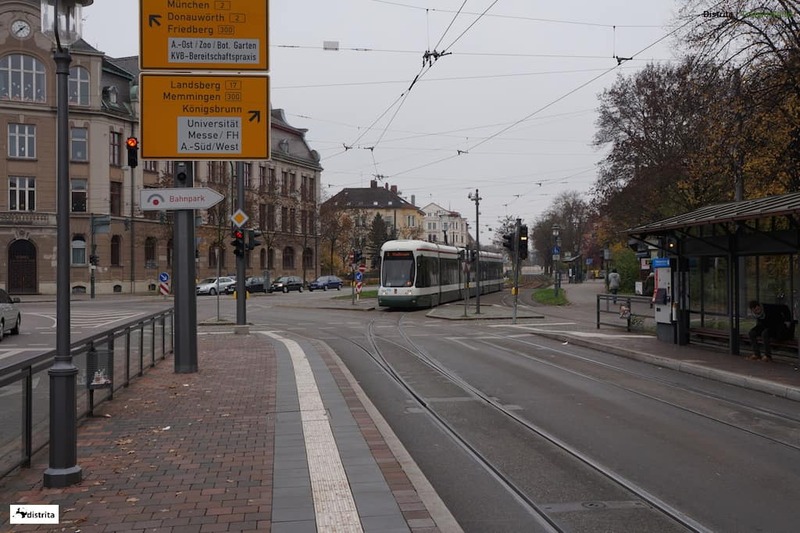 The tram tracks in Augsburg are 1000 mm gauge, which means that all of the corners can be cut more easy. There is also less squeek noises when trams cuts the corners. The scenery also looks much more cute, if that can be said about such a thing. Here in Norway, Trondheim which the only city with 1000 mm gauge tracks for 1 tram line. I didn’t notice any bottleneck as with the system in Augsburg. Great thing. 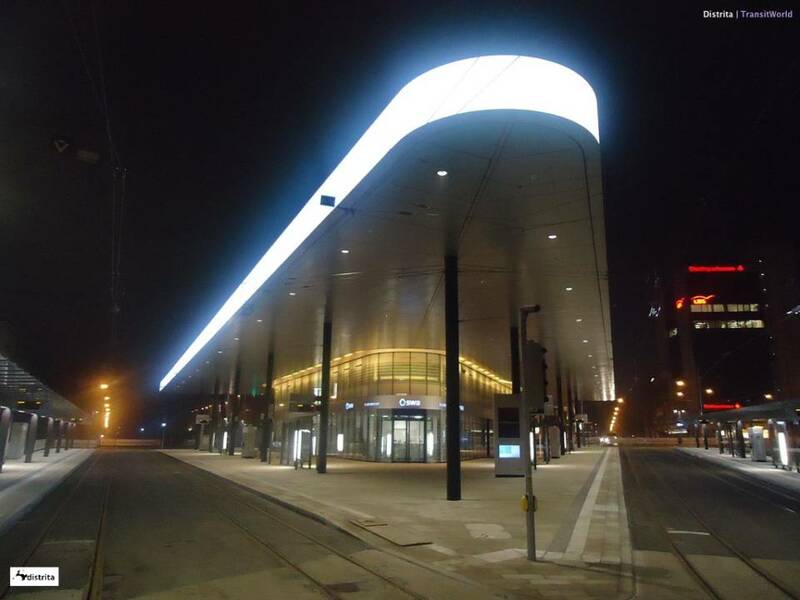 When we visited Augsburg, we noticed that the tram will get a underground station beneath central train station in the city, which will make it easier connection between Augsburg tram system and German train lines. You can read much more about this project on Project Augsburg website. Nice one! However, this seems to open in 2023. So, there will be lots of construction work in the middle of the city for some time now. Bergen in Norway should follow this city by putting some of it’s light-rail network underground also. Line 2 expects to be built under Haukeland sykehus (the main hospital), so we hope that this will be done. Trams can really run both underground and overground. If you’re city is flexible in transit planning. Then investing in trams can be really nice and building the routes is for sure cheaper also. Trams can go everywhere without getting stuck in the traffic – Effective! 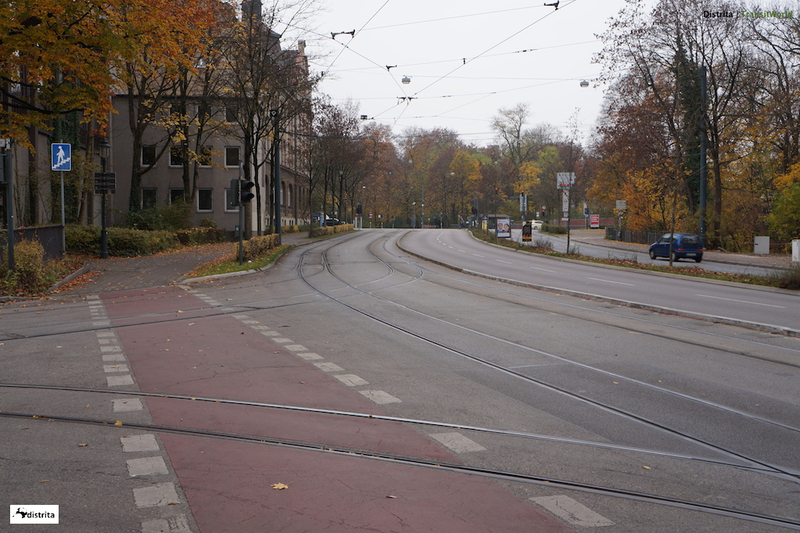 Almost everywhere in the city, we noticed that the tram got it’s own tram tracks which doesn’t collide with the cars. This makes this system very effective as the trams rarely gets stuck in the traffic. We never noticed this when we visited the town. Some places like the one on the picture above here, the tram tracks shares routes with city bus lines, which is fully ok. Oslo, now this might be something? It doesn’t seem as if the transit company in Oslo cares about it’s people traveling with their trams at all. It wouldn’t be a big thing to remove cars from the roads where trams runs at all. We think that this isn’t a big thing at all! All of the 6 lines run Monday through Sunday from around 05.00 to 23.30, but on Thursday, Friday and Saturday nights, a night bus runs from midnight to 03.00. You can buy a a single ticket for €5.80, or a family ticket for €7.40. You can also buy a Bayern Ticket. Some notes though: The Bayern Ticket is only valid after 09.00 in the morning (Weekdays) to the airport from Augsburg Hbf if you are traveling to the airport. Also, if traveling from Munich Airport to Augsburg, it may be possible to use a Bayern-Ticket Nacht (Bavaria Night Ticket), is valid Monday to Thursday from 06.00 in the morning to 06.00 in morning the next day, Monday and Friday, from 18.00 in the evening until 07.00 in the morning if you book online for €22 – 38, at the ticket machine or at the Reisezentrum (Travel Centre) for €24 – €40. The Augsburg tram system is clean and tidy. You know easy where all the lines takes you. Except for the waiting on the main hub tram station in the city center. This system got everything right! However, the German ticket systems might give you issues. But you shouldn’t get any serious issues when asking at the transit places. All of the German cities got different ticket systems. Karlsruhe, which is not too far from Augsburg got a much better transit ticket system as it covers a humongous area, but the Augsburg one ain’t bad neither. But it covers much less area! Augsburg city in Germany, is for sure an example of a city showing how a city in its size can be built with a very efficient tram system (except for the 2min wait at Königsplats station). Distrita recommends you to visit Augsburg for sure.